Destruere Pizzicato manages to take one of the most overused types of game out there - the 2D platform adventure - and turn itself into a somewhat unique and indeed amusing game. 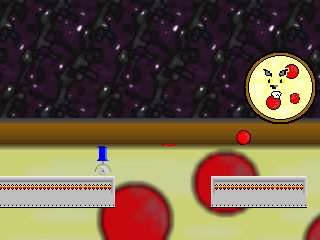 In the game, you are a pizza cutter whose job, it seems, is to destroy pizzas and other pizza related culinary delights. Zanily drawn characters that could have come straight out of a Looney Tunes cartoon are abundant, making them simply fun to see, and create an aura of amateurish charm to the game. My only qualm with the graphics of Destruere Pizzicato is that some of them are a tad unpolished and undetailed, but perhaps that only adds even more charm. Actually, the roughness of the graphics lends more character to Pizzicato. All too often games lose their personality when their creator over-polishes. But personality, character and charm ooze out of this game. The same zany charm goes for the music, which creates a feeling of playing one of those old arcade games. The music may be slightly repetitive, but overall it is of good quality and is a great aid to the arcade atmosphere that is present throughout Destruere Pizzicato. There isn�t a help guide for Destruere Pizzicato, and there needn�t be one; as with other platform games, this game follows the age old controls of right arrow, left arrow to move, and space to jump. Gameplay is short, sweet and highly amusing. I encountered a couple of bugs with the engine, but apart from that it was a relatively smooth experience. I only wish it could have been longer. It could have been polished more, however overall Destruere Pizzicato is a simple and amusing platformer with distinctively cartoonish graphics. Weighing in at a very meagre 0.7MB, it is well worth the download. Nobody has shared their opinion about Destruere Pizzicato yet. Be the first. Recommendations: The 2 people who like Destruere Pizzicato also like the following games. Nice twist on a old idea. Plays like a platformer but is still orginal. At least in the story it had. Too short to be worth download time. But it's still good for what it does. Wow, I was expecting a lot more than that. Hardly seems worthy of being reviewed. Heh.. although it may not seem like it, there is a help file. press F1 and there you go.. only 1 thing that I learned from it though.. Z to flip over. The game itself was pretty good. Very short and interesting, it didn't seem to require any high-level programming or anything to make it amazing. Overall, its pretty good, but very short and simple; it gets a 7 from me. This game has an interesting idea. I don't mean to be harsh, but hardly anything about this game was professional. With only one level, I'd barely even call this a 'game'. I'm giving some points for the originality with the designs and concept, and there's plenty of potential to be found here, but that's pretty much the only good thing going for an otherwise GM tuitoral ripoff. This was a really funny, fun, short, and weird game. quite awesome. It was too short, man! I liked the simple look on the sprites, and the controls were alright, but it was pretty buggy when stomping on an enemy. Good attempt, though. I loved the pizza cutting idea! Oh, and the ending was kinda weird.